Today in Masonic History Adolph Zukor was born in 1873. 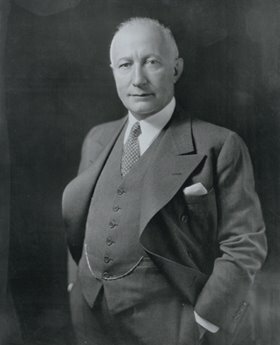 Adolph Zukor was a Hungarian-born American film mogul and businessman. Zukor was born in Ricse, Hungary on January 7th, 1873. At the age of 16 he emigrated to the United States on his own. When he arrived in New York he stayed with family who had already emigrated to the United States. He worked in an upholstery show and later got a job as an apprentice at a furrier. In 1893, Zukor headed to Chicago for the Columbian Exposition. He got a job as a contract worker sewing pieces of fur together. This led him to start Zukor's Novelty Fur. In their second season, Zukor had expanded the company to 25 men and had opened a branch. In 1903, Zukor became involved in the film industry, thanks to his cousin Max Goldstein. Zukor at the time did not fit the now popular myth that all of the the men who started the film industry in the United States were down on their luck and penniless. In fact Zukor was actually very well off at the time he entered the film business and he had the business savvy to carry him forward. When Zukor's cousin Goldstein approached him he was looking for money to invest in a chain of theaters which had started in Buffalo and were showing works by Thomas Edison. Zukor gave Goldstein the money and insisted on forming a partnership with the other investors which included Marcus Loew who was a founder of MGM and the Loew's theatre group. In 1912, Zukor formed Famous Players Film Company, which evolved into Famous Players-Lasky when it was joined by producer Jesse L. Lasky. Paramount Pictures Corporation was formed to distribute films made by Famous Players-Lasky and a dozen smaller companies that Zukor had a stake in. This led to a national distribution system. By 1917, Zukor had shed most of his partners. In 1919, Paramount bought up 135 southern movie theaters and became the first of it's kind setup where the company that produced the films were also able to exhibit the films. Up through the late 1920's, Zukor continued to build Paramount as a company. He would get the company up to 60 films per year and through an exclusive contract would exhibit them in Loew's Enterprises theaters (Loew's son would end up marrying Zukor's daughter) as well as Paramounts own theaters. Zukor also started a new theatre chain called Publix Theaters which would later become Paramount Publix Theaters. Paramount collapsed in 1932 during the Great Depression. Despite this Zukor was able to keep the company together after a bank mandated restructuring. In the 1936 Zukor became the President of Paramount and later the chairman of the board. In 1959 he was made chairman emeritus, a position he held until his passing. Zukor passed away on June 10th, 1976. He was 103 years old. Zukor was a member of Centennial Lodge No. 763 in New York City, New York.